The peppy H-Block Amity University. Every college / university campus has that one special hangout place where everyone spends most of their time. If someone is not in the class, you’ll surely find them there. 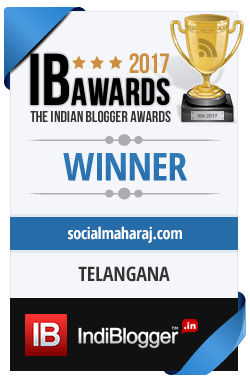 Be it the famous canteen of Kamla Nehru college or the gymkhana at IIT Bombay, every campus has this amazing hangout place. These peppy pocket friendly places are flocked not only by students but by teachers also. I’ve been a part of Amity University, Noida campus and this probably is the most happening campus in Delhi NCR. Just like every other college / university Amity too has its own share of hangout places. Be it the Gate 2C ke parathe or Olympia Cafeteria in J Block, every place has its own charm. One such peppy place in Amity University is the the famous H Block. H Block is the AC hostel for the students of the Amity University and is the tallest building on the campus. The building is not only a hostel but it houses some of the finest food joints and is a place for foodies. Even the regular canteen served up some good food, at least I enjoyed it – Hot lachcha parathas and Parval ki subzi, I mean where do you find parval outside your home ? Apart from the regular canteen there are some great food joints including the likes of Dominos Pizza, Subway, Cafe Coffee Day, Amul to name a few. The H block is huge and has a great open area in the center where usually we have concerts and other cultural events are organized. Recently the H-Block has been in news for all the good reasons ! Why is the Peppy H-Block of amity University so famous ? One of the main reasons that the H-Block is famous because of the celebrities that have been there. Remember that movie Prem Ratan Dhan Paayo which you didn’t watch and still the movie did a business of 100+ crores ? Well Sallu Bhai along with Sonam Kapoor were there to promote their movie and boy the entire H Block was jam-packed. Students having rooms in the H Block went to their rooms to get a glimpse of the couple. Bhai also started a trend which is followed by many film stars even today. The Selfie. 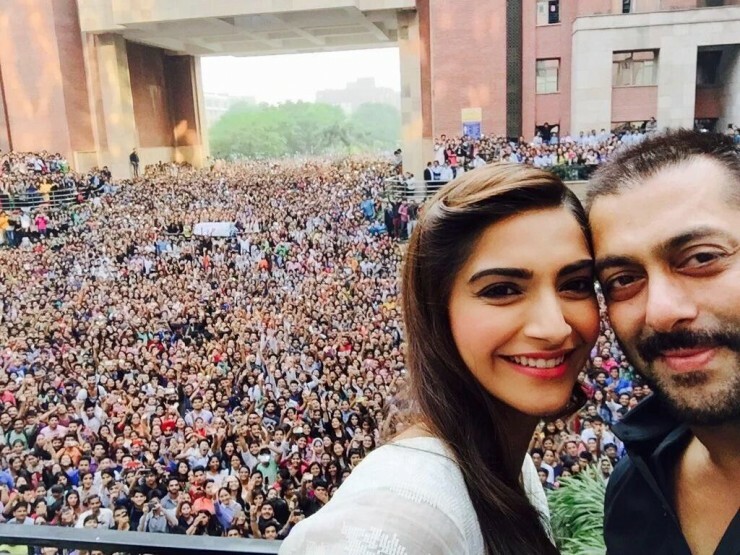 The famous selfie which Bhai took along with Sonam Kapoor with students of Amity University in the background went viral on the internet. Following the foot steps of bhai, the stars of the upcoming movie Fitoor, Aditya Roy Kapoor and Katrina Kaif visited the campus to promote their movie and to kick off the Amity Fest. The couple danced to the tunes of the most loved song of the movie – Fitoor by Arijit Singh (This guy is amazing ! Serves up some great songs every now and then) And just like Bhai, the couple took a Selfie with Amity University students. And just yesterday, the star cast of another upcoming movie Sanam Re – the gorgeous Yamini Gautam and Pulkit Samrat were at the campus to promote their movie. The couple too danced on the title track of the movie and later took a ‘customary’ selfie at the H-Block of Amity University. With such big Bollywood stars making an appearance at the peppy H-Block, it ought to be famous 😉 It’s not only the film stars but various other personalities have visited the campus. And it’s not personalities always, we’ve had the Red Bull Formula 1 Car displayed at the H Block during the inaugural edition of the Formula 1 Indian Grand Prix. And hence the famous H-Block on amity University is the most happening and peppy place on the campus. And everyone will definitely agree with me on this !